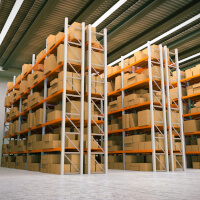 Strong organizational practices can do wonders for warehouses of all kinds. If you want to maintain the inventory in a warehouse, then you need to have a solid plan in place. There are quite a few top-quality organizational options accessible to determined and thoughtful professionals in warehouse settings. Evaluate your inventory in strong detail. Chances are that there are things you simply don’t need anymore. Go through everything and “trim the fat.” Immediately dispose of things that are simply taking up space and confusing you and the rest of your team members. This can result in a warehouse that’s a lot more streamlined and user friendly for all. Routine “spring cleaning” sessions are a must for warehouse organization success. Make regular tidying work a priority. If you want to maintain a warehouse that’s immaculate, safe, straightforward to navigate, and devoid of hazards or debris, then you need to clean it regularly. Establish a cleaning schedule that can stop disorganization from getting out of hand. If you’re interested in optimal organization, you need to assess everything to ensure that items are in their designated positions. If you notice any item in an inappropriate spot, return it as soon as possible. Ignoring stray items can lead to significant disorganization after a substantial amount of time has gone by. Pallet racking systems can be fantastic additions to warehouses that are in need of five-star organizational systems. A pallet racking system from Certified Handling Systems can conserve a lot of vital storage space in your warehouse. They’re perfectly safe, too. They epitomize strong craftsmanship. If you’re searching for organizational pathways that promote security and ample room, nothing can compete with pallet racking systems these days. Make warehouse inventory organization a team effort. You can accomplish this by assigning team members specific cleaning duties. You may ask one member of your staff to take charge of missing products that are part of your inventory. You may ask another worker to handle item-sorting projects. Cooperation from fellow warehouse employees can make attaining top-notch organization a lot easier. Organized warehouse inventory is always the goal. It’s not an impossible dream, though. If you’re practical and determined, you can get on track to a warehouse that’s the portrait of world-class organization. A warehouse that seems like a disaster zone is never a nice thought.